The Madonna & Child ( Jesus )? - ThaBadbrey Herbal. You are about to read a Spiritual/Philosophical Newsletter. That which is written below was done so in October 2010, in response to a question I received via email, from someone who was curious about the historical roots of the purported biblical version of “Mary” and “Jesus”, (for want of a better expression/term) as well as the metaphysical origins and/or meanings of the various cryptographic allegories surrounding these names, with greater attention being given to the latter. 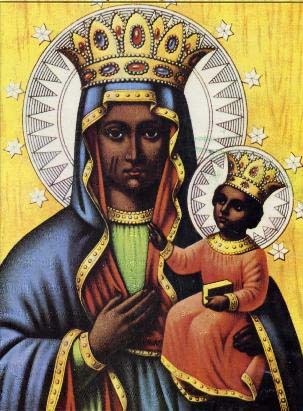 The biblical figure of Mary is nothing but a “Remixed Christian Version” of the deification of the “Female Creative Energies” via the manifestation of a female archetype. This archetype took many forms throughout the “ages” and usually reflected the feminine side of the “peoples” who chose to use this representation. 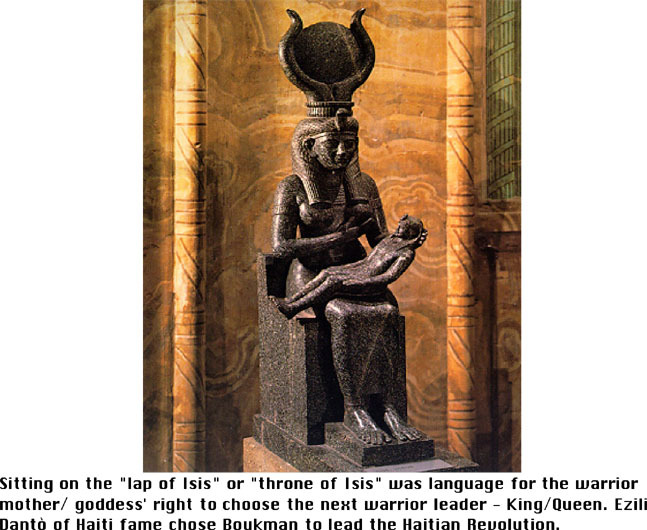 Obviously the Egyptians chose “Isis” as a physical manifestation representative of this energy type, and obviously, Isis was black, as she represented the female side of the original Egyptians who where indeed, black (prior to the “Hyksos” invasion = the true source of the perpetuated myth that the original Egyptians were “Light-Skinned”). A large majority of the myths surrounding these “deities” all deal with a “Female” who produced a “Son” via a “Virgin Birth”. This has caused a great deal of confusion since its inception into the collective consciousness of those who seek the truth. Most of these stories are allegorical tales mixed in with historical events for the sole purpose of confusing the populace while obscuring the true meanings of these stories/metaphors/allegories. the reason that these “Jesus-Like” figures had to have been conceived through a “Virgin-Birth” is due to the fact they had to ALREADY BE at a certain level of “Spiritual Advancement” upon entry into The Physical Realm. While this is near impossible to achieve by two human parents, it is established with less difficulty when one parent is human and the other is; “The Ether/Realm of Spirit/Love” itself. 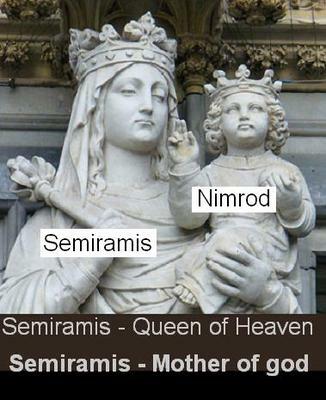 Therefore,”The-Ether” on most occasions, manifests a portion of “itself” as a “Human-Archetype” (known to many as an Angel) and appears to the “Virgin Human Female” and etherically impregnates her. This Woman then gives birth to a human incarnation who is extremely enlightened and spiritually advanced. This enlightened individual then attends the various secret “Mystery-Schools” of the time and passes each initiation, within these establishments, with “flying Colours”, outperforming all of his/her contemporaries. Upon reaching adulthood, the enlightened individual travels a chosen area of the world and helps many to overcome the death->reincarnation cycle! In most cases, the enlightened “Jesus-Like” figure then finds a partner and raises a family of their own. However, while they themselves may fully understand the secrets of the universe and perhaps all of existence, sadly, their partner does not. Neither do any of their children except upon a basic level. The “Jesus-Like” figure then reaches old age and chooses to ascend, travelling back to The Ether from whence they came…lol. Having completed their mission upon earth for that particular time period, they then leave behind their family who now have a greater incite, into the inner workings of the universe, than most other human beings on the planet. The biblical Jesus is but another version of the many “Jesus-Like-Myths” that have surfaced within many cultures all over the world. His colour of which reflects those who “He” was in and amongst, dependent upon the “colour/ethnicity” of the “peoples” who lived within that particular location upon the planet at the time period in which “He” was active. According to the apocryphal Gospel of Mary of Magdalene (The Wife of the Biblical Jesus), Mary bore Jesus’ children. This was, however, removed from the bible during “The Council of Nicaea“ where Emperor Constantine decided to take it upon himself to decide which “books” should be included in the bible and which were to be seen as apocryphal/not spiritually inspired. All Traces of Jesus’ childhood, his married life and his teachings on reincarnation were removed as a result. It has been extremely difficult for researchers to track the descendants of the biblical Jesus, solely because the accounts in the so-called Bible are a mixture of metaphor, historical manuscript and cryptogram which all contribute to the confusion..lol,.. According to my research….. There are so much points written in the above that I could expand upon, but it will take too long. hopefully what I have presented should suffice.